« Kink more pervasive than we thought? I’ve recently been mulling over getting a tattoo – not that I’ve mentioned it to anyone yet, let alone my master. This is the first public outing. I don’t want any ordinary tattoo either – I want something that shows I’m owned. Collars are great, but they’re uncomfortable to wear, or at least sleep in, and they do rather show at work (I wear t-shirt and jeans normally). I’m intrigued and enlightened by this post. 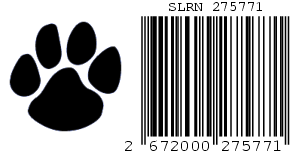 I vote for the paw and bar code combination as I think it connotates what you want best. PS: I never knew you were a branded slave; please elaborate more on why you did that and your thoughts behind it?